Do you just believe everything you find on the internet or TV just because it’s the most trusted source? Well, now you shouldn’t. As time flew by not only real news but fake news has started to surface as well. Plus our social media doesn’t take much time to make it viral. Many incidents you thought had happened might just be a fake news but it would be so viral that you never thought of verifying it and even took a single consideration that it might be fake. 1. John Lennon and Che Guevara jamming. This never happened. Only the miracle of Photoshop ever brought these two together. Che Guevara died in 1967, a full five years before this photograph of Lennon, and dead men don’t jam, I guess. 2. Elephants thinking humans are cute like puppies. Sounds nice, but it’s too good to be true. Well, it could be true, but no studies have ever turned up any findings of elephants seeing humans like puppies. 3. A coyote being mistaken for a dog and given a bath. Wouldn’t that be funny if it was true? It’s not though. Well, the animal in the bath is actually a coyote, but it was never mistaken for a dog — it’s a pet coyote. 4. Blue strawberries, created by splicing fish genes into them. This is as fake as anything you could find on the internet. Blue strawberries, in reality, are poison because they’re not strawberries, they’re some wild fruit. And with the addition of fish genes, OMG, this is too much to handle. 5. Groomsmen holding up a paralyzed groom to kiss his bride. Sounds sweet, and it’s easy to want this to be true, but nope. The groom is able-bodied, and he and his groomsmen are just “locking up” for a frat pose. Being practical, if the guy would be paralyzed this wouldn’t at least be the pose of kissing. 6. Police raising the hoods of their cars to obstruct their dash cams. Okay, the police vehicles clearly have their hoods up, which would prevent their dash cams from recording anything. But the hoods are up to keep electronics in the car from overheating and melting on a hot day. 7. A heavily tattooed Jimi Hendrix driving. The photo is real, but not the ink. You knew that one, right? The discovery of a fabled furry stag like this would be newsworthy, for sure, but no such thing was discovered. In fact, the “Marbled Fuark” in the photo was a figurine created by artist Lee Cross. An animal like this would be God for me! 9. 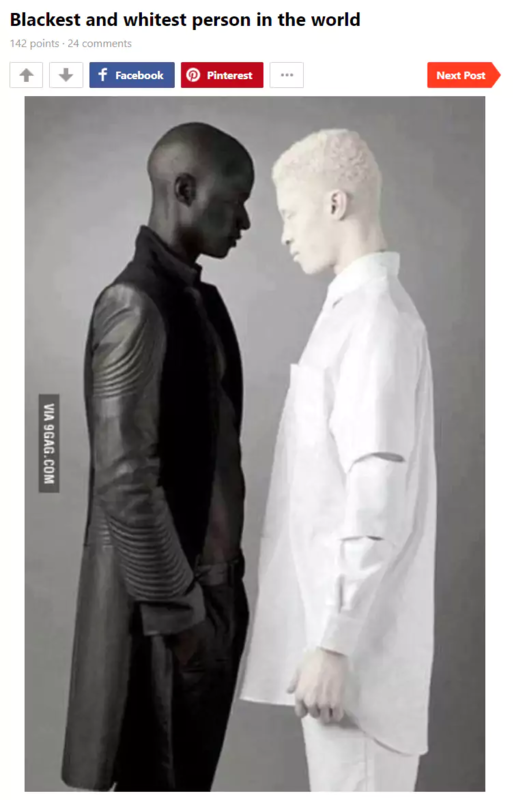 The “blackest and whitest” people. 10. A waterslide towering over Dubai. Sure, this would be the world’s tallest water slide, but it’s definitely a fake — digital artist Robert Jahns cooked it up. You can even see his signature faintly near the top of the image. Just another internet fake news. 11. This supermoon appearing to line up perfectly with a radio telescope’s dish. Seems like a perfectly timed image, with the moon perched in the dish like a big red ice cream cone. It’s actually two images stitched together by photographer Chris Pegman. Even you could do this with some Photoshop skills. 12. A raccoon riding an alligator. Although someone submitted this pic to local news in Florida with an explanation, the supposed photographer never responded to any requests to get in touch to confirm the photo’s authenticity. However, a known social media prankster did take credit for the pic later, saying that both the racoon and the alligator were taxidermied, and showed the Washington Post pics of herself setting it all up. This isn’t fake but yeah, rigged. These all were less than a fraction of all the fake news we have been believing all these years. There are infinite which we might not even suspect. These are hilarious and very believing of course, but not real. I'm a human just like you. So Guess What! We're basically same. If you're reading this then you are either on weed or you clicked it by mistake Or maybe I'm a good writer.